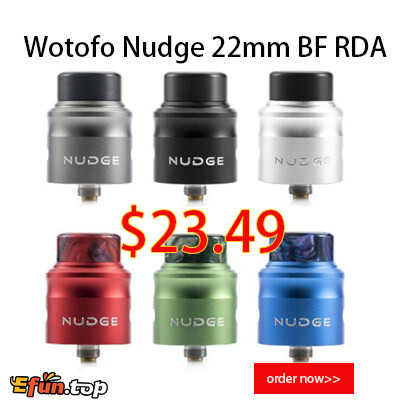 Why SO Many People Choose Wotofo Nudge 22 RDA? More and more vapers choose RDA why? First:big cloud , second :better flavour.But how to choose a good RDA? Wotofo Nudge RDA, featuring 22mm diameter, is designed with the 4 posts in stagger and side open post hole system which enables easy rebuilding. Features the deep juice deck and juice shed system, it will hold more e-juice to deliver a dense flavor. With the included BF Pin, Nudge RDA is easy to refill and brings the chase cloud vapor.